Seder Plate constructed in 2008 from recycled tin cans; 10 k. gold, sterling silver and aluminum rivets; stainless steel and brass screws. 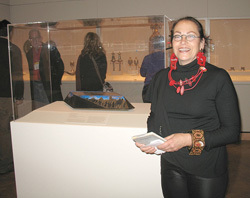 Here I am standing in front of my seder plate Eons of Exodus at the Minneapolis Institute of Art. Scroll down the page for close-up images and lots of information. Watch me on SPARK KQED PBS Channel 9 TV. This program can now be viewed on line. Watch the studio visit showing the construction of this seder plate and the completed seder plate displayed in the exhibition in the SPARK episode featuring The Contemporary Jewish Museum. The affiliate links for the book above are provided for your information. Purchasing these books may provide this web site with a few cents to cover expenses. Below are several different views along with an Artists Statement and more detailed description. Constructed from recycled tin cans, Eons of Exodus speaks to the history of the Jewish exodus, both in form and narrative. 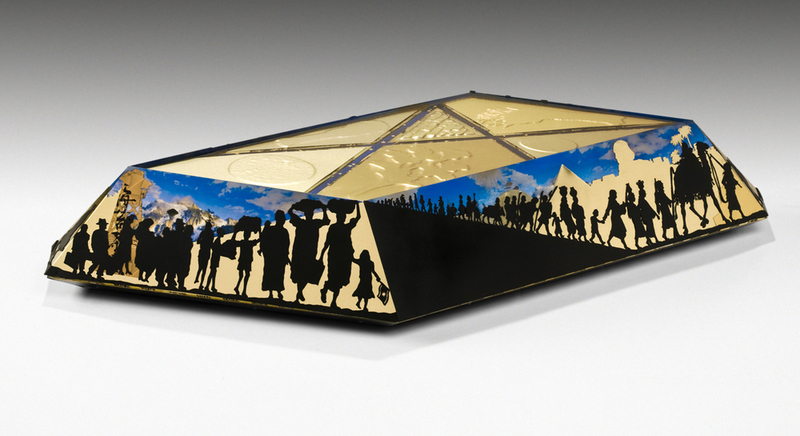 The design of the Seder plate reflects the Egyptian pyramids of the original exodus and mirrors the angular architecture of the new building for the Contemporary Jewish Museum in San Francisco. 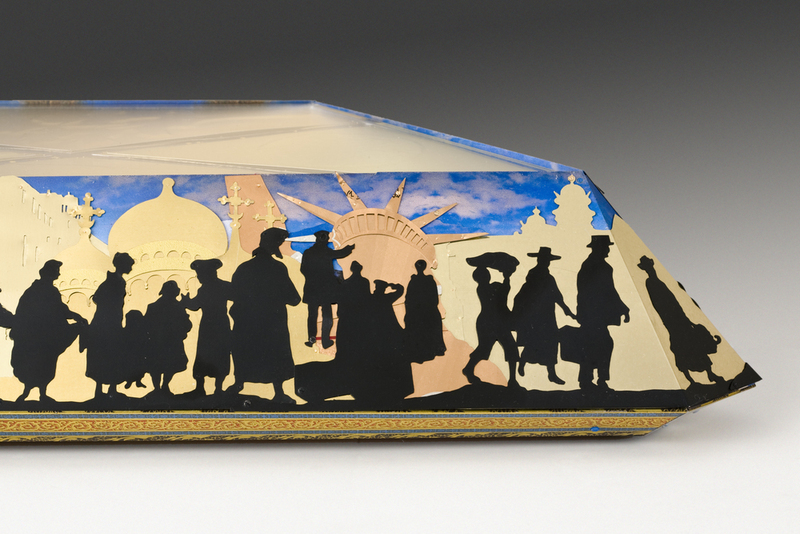 Each side portrays iconic landmarks where the Jewish people have lived throughout the eons. At times the Jewish people were required to wear identifying clothing as illustrated by the pointed hats of Germany. Despite much improved awareness of history, countries, religions and cultures around the world continue to exhibit intolerance and violence against other races and religions. Even the United States resorted to forcible internment of Japanese-Americans during WWII to so-called “relocation camps.” Now, in the 21st century, the persistence of man’s inhumanity continues, as seen in Africa, with the lost boys of Sudan and the civil unrest in Darfur. The pathways of history reach across the millennia in the Seder ceremony – the parsley dipped in salt water reminds us of our tears and the tears that others continue to shed today. It is my hope that Eons of Exodus inspires conversation and reflection. When we acknowledge and learn from the brutalities in our history, we can reclaim a sense of humanity for ourselves and for future generations. The orange is a recent addition to the Seder Plate. The story goes that during a heated discussion about whether women should be ordained as rabbis, a heckler called out that a women belongs on the Bimah (the pulpit) as much as an orange belongs on a seder plate. Since then an orange is placed on the seder plate as a feminist statement about both women's and gay/lesbian participation in Judaism. Tradition and observance unite to celebrate this festive occasion. A Plexiglas panel fits snuggly recessed into the top which protects the Seder Plate from food and makes it completely usable.